Tchorly-Boadi's thesis discusses the "increasing feminisation of migration" in West Africa. 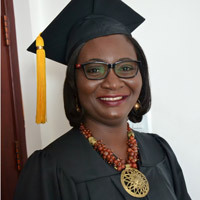 As Tchorly-Boadi puts it in her thesis, the “increasing feminisation of migration” has affected not only Ghana, where she will graduate with her Master of Arts in International Relations degree at Webster’s campus in Accra, but also West Africa more generally. The thesis engages with the theoretical literature and offers a series of practical recommendations for policy makers and suggestions for future research. Webster international relations professors Leonard Suransky and Alexander Vautravers lauded the thesis as a “valuable contribution to a new, and in some ways revolutionary development in the socio-cultural and economic realities of West Africa” that engaged with issues of political economy and gender politics, as well as constructivist grassroots initiatives in the region.